The Carolina Bird Club's bonus field trip to the Chesapeake Bay Bridge-Tunnel and the Nags Head area ran the weekend of December 17th. Although the weather was forecast to be quite a bit less than optimal, this was one of those times when actual conditions were much better than anticipated. Temperatures ranged from a low of 42 leaving the hotel for the CBBT Saturday morning to a high of 81 on the drive back toward Raleigh. While precipitation was feared to be a big part of the weekend, sunshine was more the rule, and other than a brief shower that occurred while participants were thinking of sugarplums and mistletoe in the wee hours of Sunday morning, not a drop of rain fell. We started off on the CBBT, visiting islands one through four. 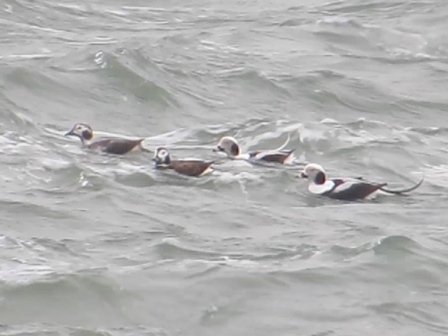 All three North American species of scoter showed well, joined by the always impressive Long-tailed Duck. 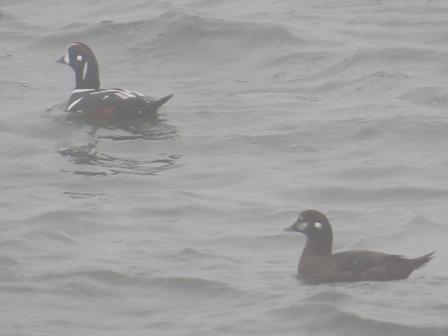 Highlights on the bridge-tunnel were a stunning pair of Harlequin Ducks and a close-by Red-necked Grebe. While most of the harlies spotted on the CBBT are female-plumaged, the crisp male accompanied by a female was quite the treat! 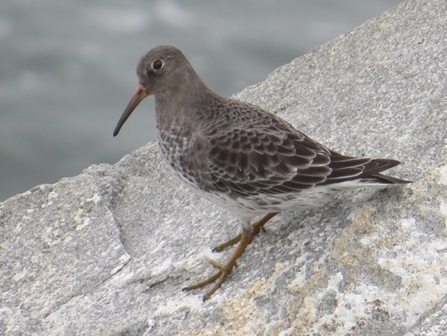 Purple Sandpipers lurked among the rocks while Great Cormorants sunned on concrete blocks. Mammals tried to take some of the spotlight away from birds as well, with Inshore Bottle-nosed Dolphins nearby, Harbor Seals bobbing in the water, and most surprisingly, a pair of River Otters miles “out to sea”. I knew they were quite happy in estuarine habits, but seeing a pair swimming in the salty Atlantic miles from shore was a complete surprise. The aircraft carrier George Washington passed through the islands 1-2 channel as we arrived, always an impressive sight. After lunch we found our way through Mackay Island NWR toward the Currituck Ferry, spotting American Bittern in the roadside ditch, Snow Geese and Tundra Swans in the sound, and ducks flying by in neat chevrons. Again non-birdlife tried to steal the show as we found a gorgeous Coastal Plains Milk Snake on the 0.3 mile loop trail at the south end of the “big causeway” in Mackay. The snake allowed for brief handling and an impromptu photo session. A golden sunset across Currituck Sound accompanied our boarding of the ferry, and the end to a beautiful day (although the silver moon rising from the Atlantic a few hours later tried to steal the show). 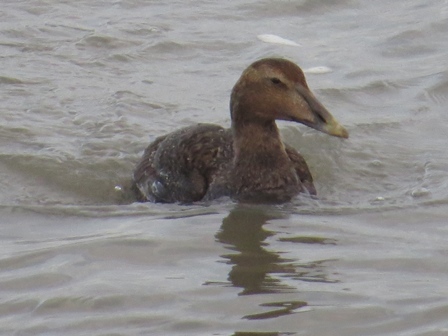 Sunday started at Jeanette's Pier where once again three Common Eider put on a show. Interestingly these were not the same eiders as last weekend (2 females and 1 immature male yesterday versus 2 immature males and a female last week). The eiders fed on small, white silver dollar-sized crabs, and paid zero attention to the surfers paddling out with a few yards of their activity. 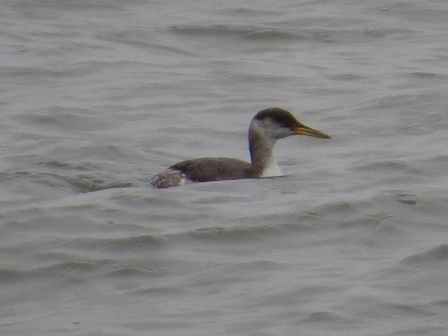 The eiders were as close as ten yards to shore. The pier also hosted the continuing Black Scoters, with adult male, immature male, and female feeding directly below us and posing nicely for photos. Also at the pier were a Parasitic Jaeger and an estimated 1,500 Northern Gannets showing pretty much every plumage imaginable from all black young birds through birds with black wings and white head and tail, to adults, with everything in between. Pea Island was absolutely packed with waterfowl, the most birds I think I've ever seen. Rafts of Redhead must have numbered in the tens of thousands. Highlights included a Long-tailed Duck in New Field Pond. But again, non-birds stole the show. Since we spent quite a bit of time ocean watching in the morning, I did not plan to do any at Pea Island, but while some of the folks were cycling through the restroom, I bopped across the street to look at the ocean. While scanning behind the boiler, a Humpback Whale performed a full breach… and then two more! Most of the trip participants got over to see the whale perform repeated lunge feeds where it would come straight up out of the ocean with gaping jaws (and fish flying out of the way) to crash down with pleated throat pouch full of water and food. From time to time a long-white pectoral fin would wave back and forth, almost as if the whale were acknowledging the big smiles watching from shore. As one of the folks on the trip said, it was like that Pacific Life commercial! After a stop at Bodie Island, and CSI on Roanoke Island to twitch the Lark Sparrow (sitting nicely in the scope for all to see) we ended the trip at Alligator River with Bald Eagle soaring overhead in the 80 degree sunshine (!) and Greater and Lesser Yellowlegs foraging side by side at River Road. So for a weekend forecast to be windy, wet, and grey, we ended up with just at 101 species, incredible looks at scores of highlights, impressive mammal sightings, a reptile and amphib list that exceeded three, and great weather. Not a bad way to spend a pre-Christmas weekend!